One of our esteemed manufacturers Preciosa have just completed a flagship chandelier design and installation project at a luxurious casino in Macau, named the Asian Las Vegas. The Macau region lies 40 miles west of Hong Kong, south east of China and is known as a gamblers paradise. Within this area there is a resort called Galaxy Macau where this fabulous contemporary chandelier lighting fixture has been installed. The project entitled the Fortune Diamond has involved designing and building a 6 metre high jewel within the building which is made to the shape of a cut diamond. 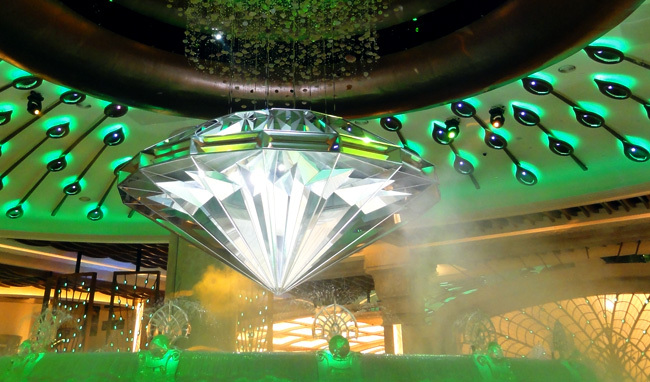 Every 30 minutes there is a fabulous display where the diamond emerges from the fountain and floats upwards and the elements of the Preciosa lighting display ascend towards the ceiling. The whole display is synchronised by computer control so the raising and opening of the diamond is seen as part of a magnificent lighting display. The show is further enhanced by the use of a magical musical score to bring some real splendor and precise choreograpghy to the display. This truly magnificent display is a statement symbolising wealth, luck and love which represent 3 key attributes that the Galaxy visitors strive for. This chandelier display is one of the most fabulous in the world and involved an immense amount of work to complete. The programming of the display alone took 2 months to complete. The manufacture of this elaborate contemporary chandeliers involved building 4 interlocking polished stainless steel rings of massive proportions, the largest of which is 8 metres in diameter. The contemporary chandelier is then ornamented with over 2000 hand blown asymmetrically shaped crystal components together with almost 70000 cut crystal trimmings. All in all this creates a massive chandelier structure which weighs around 1.5 tonnes which is 8 metres in diameter and raises to a height of 13.5m when fully extended towards the ceiling. Preciosa are one of the most prestigious and longstanding manufacturers of fine crystal and chandeliers in the Bohemia region of the Czech Republic. They have traditional roots but have now advanced with the times to be one of the worlds most recognised manufacturer of contemporary chandelier and crystal lighting. In order to reach this position they have acquired some of the world s best lighting designers namely Jaroslav Bejvl Jr., Jaroslav Bejvl, Lukáš Rohan and Josef Oulehla and their works of art illuminate the Galaxy together with other spectacular buildings. Accordingly Classical Chandeliers have elected to work with Preciosa for selected design projects especially where contemporary and original lighting design if required for the success of the project. You can view some more of Presiosca designer designer chandeliers here to give an idea of what is possible. However if you require the maxiumun impact is is generally better to take these ideas and then work towards producing a bespoke design which is specifically made for the space that the lighting fixture is planned to occupy. This way you can be assured of maximum visual impact and originality. Previous PostOnly Fools and Horses Chandelier Sketch- by popular demand! !Next PostHow much bling should I have on my Crystal Chandelier?